Polarisation Field (P-E) measurement of poled soft PZT composition taken at 1 Hz, five consecutive loops overlaid. Polarisation Field (P-E) measurement of a 1 μF ceramic multilayer capacitor taken at 1 Hz. The sample is a composite multiferroic with a sandwich of piezoelectric dielectric with magnetostrictive nickel electrodes. 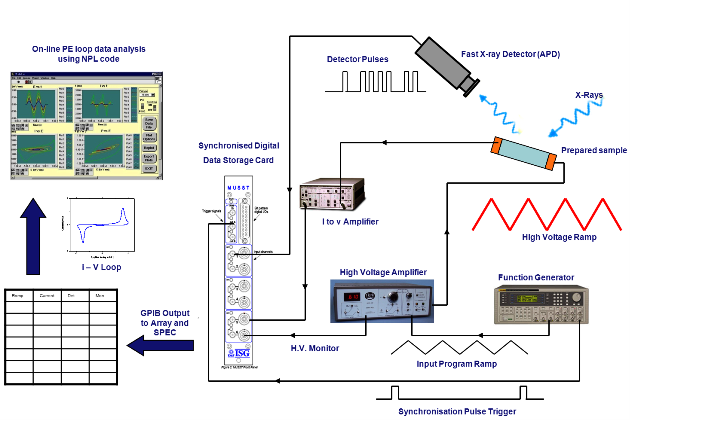 The electrical response and the diffraction data can be measured simultaneously by means of a fast acquisition card under the application of either a constant or oscillating field. The MUSST (Multipurpose Unit for Synchronisation Sequencing and Triggering) card developed by the ESRF can collect data in each separate channel at rates up to 20 MHz. This development aims to help users to carry out studies of ferroelectrics and multiferroics in complex conditions such as magnetic and electric fields. 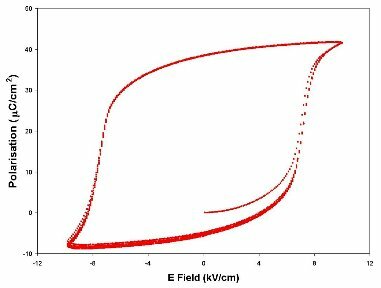 Currently XMaS offers an electric field sample environment with potentials of ± 2 kV with temperatures down to 2 K in a 4 T magnetic field. 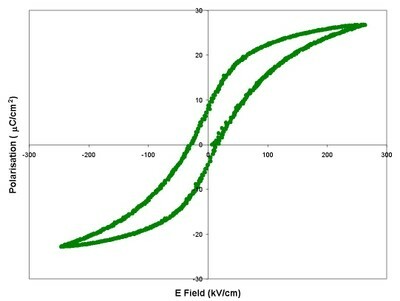 A separate sample environment provides ± 10 kV down to 10 K in a 1 T field. Samples must be coated with e.g. gold and electrically isolated by a sapphire support. 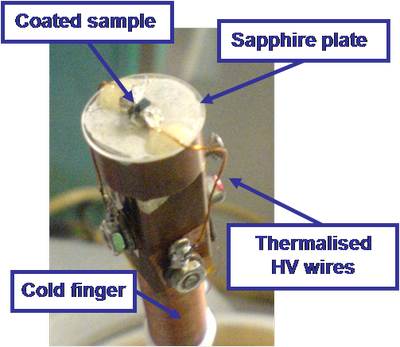 The HV wires that are connected to the cryostat, are soldered on the gold. For more details on the P-E measurement system contact Mark Stewart at NPL. More information can be found on the Multiferroics wiki development by NPL and XMaS. If any custom sample environments are required, please contact a member of beamline staff as soon as possible and we will try to accomodate you. Previous examples have included equipment for performing in-situ studies of surfaces in the electrochemical environment. Electrochemical cells have been developed to allow control of the solution and sample temperature over the region of -5C to 80C and to permit studies of electrochemistry in a magnetic field. Preliminary experiments on the surface reconstructions of Au(111) and Au(001) in electrolyte have been performed.